One of the best ways to communicate your campaign’s purpose and goals to supporters is through a customized microsite. A microsite is a webpage or group of webpages that are devoted to a specific campaign or initiative. If you think of your website as a book, a microsite is like a chapter dedicated to a specific fundraising campaign. It helps you to organize your information and make it easy for people to find what they need. The good news is this doesn’t have to be a huge undertaking that requires the help of engineers and designers. On Classy we call these microsites Landing Pages and we’ve made it easy for you to build them and brand them to your organization without a single line of code. Before we get into that, however, let’s talk about the components of a quality microsite/landing page. As Classy product expert Terri Harel said in a recent webinar, donors give most often to nonprofits because they know and trust the organization. They want to know that their gift will go directly toward your mission, so your microsite needs to reflect that. John Wayne Cancer Foundation’s #ShowYourGrit landing page is customized to put their brand front and center. Customize your Landing Page with your logo and brand colors to show that the webpage is yours and the campaign will support your work. Along with assuring supporters they are in the right place, a clearly branded microsite looks more professional and can increase conversion rates. In fact, branded donation pages raise 38 percent more money than generic ones. But it’s not just your colors and logo that create trust, the way you feature and communicate your work is also important. Use pictures, videos, and text blocks to tell visitors to your microsite what their contributions to this fundraising campaign will help accomplish. One of the best things about creating a landing page dedicated to a particular campaign is that it allows you tell the campaign’s story. Some donors may already be familiar with your cause and programs, but a campaign microsite gives you the opportunity to show why they should give to this particular initiative. Team Rubicon’s microsite for flood relief in the Gulf Coast features a picture of an affected neighborhood and includes a video showing their disaster response team at work. Video is an especially good tool to tell your campaign’s story and beautiful pictures of your work and the people affected let your audience see your mission with their own eyes. Along with building trust, this helps donors make the personal connection that moves them to take action. Ultimately, your fundraising campaign is meant to mobilize your supporters to donate and fundraise for your cause. That’s why you must make it easy and intuitive for them to take action. Once you have established their trust and shown the “why” of your campaign through storytelling, you need to show your audience how to help. Reading Village’s microsite for their 10th anniversary campaign illustrates the impact that different giving levels will provide. The new Impact Levels in Classy Crowdfunding makes it easy to not just offer your supporters suggested giving levels, but to show them what these donations will accomplish. 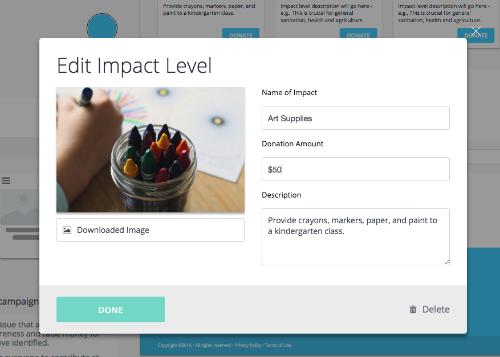 Simply add a title, picture, and short description to empower donors to make a difference. In the new Classy Crowdfunding, you can create a beautiful, functional Landing Page without design or programming expertise. From your campaign headlines to your background image to the color of your donate buttons, you have the freedom to make a Landing Page that is unique to your organization. Here are a few helpful tips for setting up your microsite. 1. Bring your brand to the forefront. Selamta Family Project uses their logo and brand colors to make this microsite uniquely theirs. Because Classy’s pages are mobile-responsive, it looks great on any screen. 2. Grab donors’ attention with a compelling headline. Simply type your headline and subheading in, and it appears on your page preview. 3. Add images and video to tell your story. Upload your best impact photos or choose from the library of free-use images. 4. Customize your impact levels. Bring your impact to life by showing donors exactly what their money will provide. All you need is a picture and description. A microsite can make a big difference in the presentation and reception of your campaign. It gives donors a cohesive experience and shows them why and how they should contribute to your mission. And now, any organization has the power to build a beautiful microsite/landing page that activates their audience for good. Keep these tips in mind to help reach your audience and communicate your campaign effectively.